One of the hottest beauty trends this year, the CC cream has finally come to town! Women’s new best friend and secret skin stylist, here’s why women can’t get enough of this latest beauty boon. From a casual brunch with your girlfriends to coffee dates with that someone special; CC cream takes care of your skin with the right touch of make-up to give you that perfect look in just a few minutes. Lakmé has recently introduced Lakmé CC cream, available in two shades – Beige and Bronze. 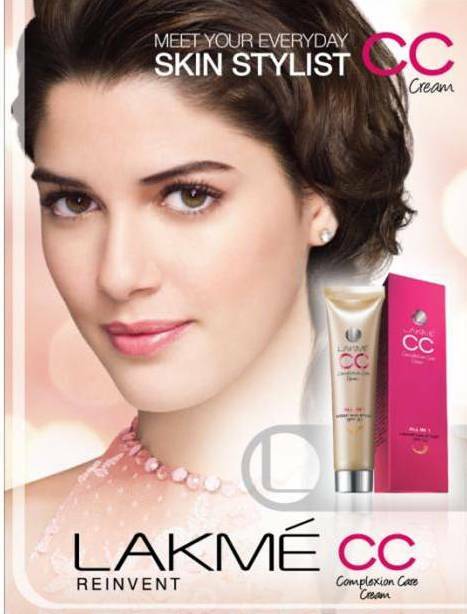 Lakmé CC cream is specially formulated to moisturize and instantly style your skin. So swap your tote full of beauty products for your latest skin stylist. Get the perfect look for every occasion, and make the most of your CC cream to create simple and gorgeous looks within minutes. CASUSAL AFFAIR: Planning to go out for a movie or with the girls for a casual dinner? You don’t need to be dressy but you don’t have to be unexciting either. Mix and match from your wardrobe and accessorize to dress up any simple outfit. Face: CC cream works beautifully for casual occasions. Its light, moisturizing and conceals all blemishes. Dab and apply the cream in dots across the face and neck and gently blend it using fingertips. Add colour to your cheeks – apply some blush. Eyes: Try the winged eye look with a think line of Kohl on your lower lash line. Don’t forget the mascara. go in for a deep red for a burst of crimson. sophisticated, but definitely not boring. Make browns, pinks and peaches your best friends at work. For an after- hours party, use Lakmé CC cream to even your skin, and create some drama by lightly brushing some shimmer on your eyelids. Face: Lakmé CC creams is perfect for office wear. It gives your coverage with an even skin tone. Dab and apply the cream dots across face and neck and gently blend it using finger tips. Lips: leave the red and oranges for the after-hours, pinks peaches and neutral browns are the best for office hours. Don’t forget to apply lip gloss after the lipstick for a bit of pop and lusciousness. Face: Begin with Lakmé CC cream. Dab and apply the cream in dots across the face and gently blend it with your fingertips. Apply some blush on the cheeks. If you wish you can also use bronzer before the blush. Eyes: Try a smoky eye look with a twist of colour. Instead of black and charcoal play with colours like blue and silver or aquamarine and green, or even black with a pop of bronze and gold. Lips: With your eyes being the focus go in for barely. Interesting post and great review, as always Radha!!!! Informative post dear...should try this soon! I really want to try CC cream. :) Thanks to lakme for the PR.